IN A boardroom in the countryside outside Birmingham sits a weary Gregg Mayles, creative director at renowned studio Rare. With just a few weeks to go to the launch of arguably Rare’s most important ever game, Sea of Thieves, Mayles hunches over his laptop writing dialogue, fielding emails and greeting media visiting the offices set amid the rolling fields near Twycross. Almost 180 people at Rare are working furiously like Mayles to finish the pirate-themed co-op adventure destined for release on March 20 for Xbox One and PC. But a heavy burden of responsibility falls on the shoulders of the studio now owned by Microsoft. Sea of Thieves represents one of the US giant’s few big first-party releases this year, and hopes to help Xbox claw back market share dominated by PlayStation. Thing is, SoT doesn’t fit a convenient genre and actively swims against the tide of gaming’s most common conventions. But Rare was always thus, producing innovative and distinctive titles such as Donkey Kong Country, Goldeneye and Banjo-Kazooie over its 30-year history. Across the room from Mayles is painted a mission statement on the wall: “We make surprising and delightful hit games for Microsoft that players love to keep playing.” If it sounds a bit twee and corporate, ignore it all except for the “surprising and delightful” bit. For that just about sums up Sea of Thieves, a game in which up to four players team up to sail ships, solve riddles, locate hidden treasure, attack giant serpents, transport cargo, fight skeletons and raid forts – not forgetting drink beer, play music, and puke on each other. At the core, though, of this vision is another of Rare’s mantras, this one painted on the wall of the lobby: “Players creating stories together.” SoT has no narrative to speak of, no mission-led storyline to guide you like a thread through its sizeable world of islands and oceans. Instead, it leaves the goal of becoming a pirate legend entirely up to you. But that’s entirely intentional, according to Mike Chapman, the game’s design director. The idea of players cooperating was the spark for everything when development began in 2014. “At the time we were looking at things like Day Z getting really popular. Eve Online was going from strength to strength. Rust had been released and was getting a bit of an audience. These were very much games that were less about telling players what to do and taking them on a journey with a linear focus narrative. “It was more of, here's an immersive world, here's a set of tools. Based on groups of players cooperating and conflicting in this world, you'd have an explosion of possibilities that would occur. We saw that trend occurring. “At the same time where we thought we could innovate was to build a game that celebrated ‘soft skills’. When you think of traditional hard skills, it’s how good you are with the controller, your reaction times, increasing stats, those really hard, skill-based things. But ‘soft skills’ reflect how you work together and feel a wide range of emotions, how you use natural-language skills and experience from real life to do well in a game. “We wanted to build a game where if you worked with somebody else, it was more than just more firepower. There were other ways that you could contribute. Studio boss Craig Duncan elaborates: “The reason we docked on pirates was because thematically people understand what pirates are. People have a view of what to do as a pirate, so if you put a ship on the water and you give people pirates and you give them some grog, some music, some weapons, they will figure out what to do. “It has this ultimate pirate-movie feel of The Goonies or Treasure Island. It's that shared adventure of a team. Sea of Thieves actively defies current wisdom about game design, that the player must be led by the nose, that the game world must be populated with icons to attract their attention, or that an in-game map keep track of other players. SoT does none of these things, forcing you to cooperate with your fellow pirates. Chapman explains: “We didn't want to make a game where you played the UI. We wanted to make a game where you were immersed in the world. That's why there's no crosshairs on the weapons. There's no mini-map. The map is a physical object. Quests are physical objects. When we put them on the table, they're physical objects. It's all very deliberate. “That core vision for the game, where things are physical, they're tangible, there's limited HUD, it's all based on communication, that was the core vision at the start. 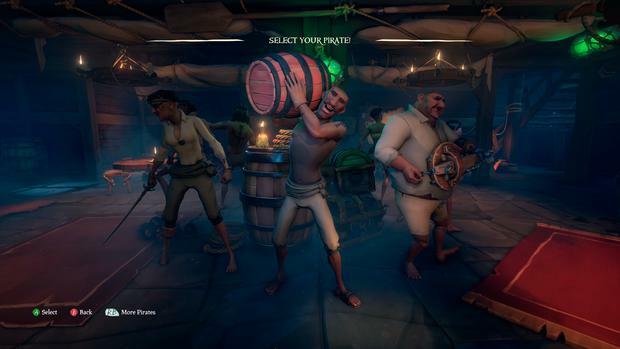 By the looks of it, the game you can play on March 20 will be quite different from the version of Sea of Thieves enjoyed by tens of thousands of alpha testers since the first reveal at E32015. Likewise, Rare envisions a multi-year plan for the evolution of the game, conceding it couldn’t fit in every great idea on day one. So in two years’ time, it could be wildly different too, based on community feedback. “Beyond launch, we want to keep making content for this game,” says Chapman. “There's already people loving it. We've got an audience. Myself and the design team, we want to keep going. There's things we prototyped we'd love to put in the game and there's new directions that we could go in. 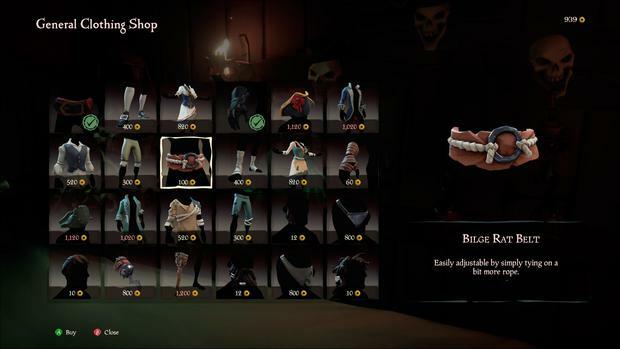 While SoT does have some RPG elements – the central currency for which is reputation, based on completing quests for a range of trading companies – your character won’t find legendary gear with high stats, or discover new skills for your weapons. This flat progression system means the most experienced pirates possess effectively the same stats as a newbie. Anything is therefore possible in battle and success depends on your wiliness. 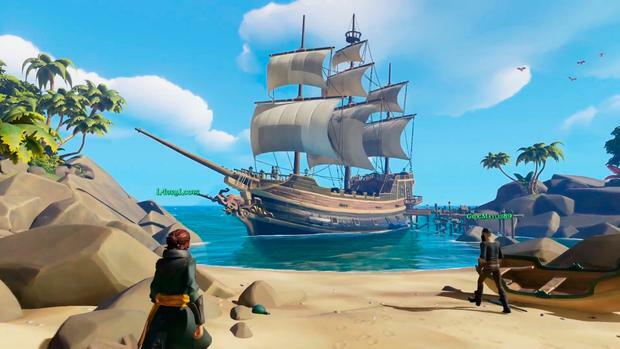 Rare has taken a lot of time to consider the inevitable griefing that will go on in any multiplayer game. The studio, of course, actively encourages conflict (it’s not called Sea of Thieves for nothing). Your crew could, for instance, never bother to locate treasure but just follow another gang and then try to hijack them. 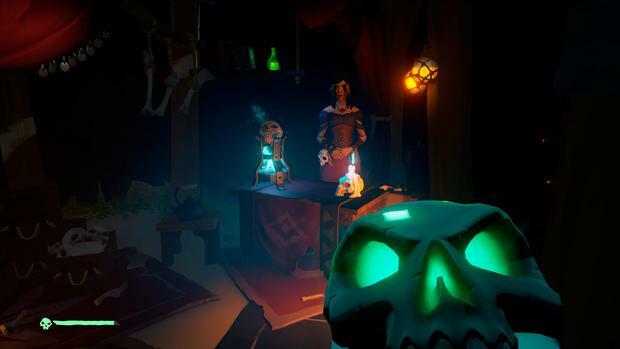 But for individuals – or really rogue crews – Rare has some plans. Chapman breaks it down: “Say you've got someone in your crew that's not pulling their weight. They're driving over a reef deliberately or they're chucking treasure chests overboard or they're blowing powderkegs up in your face. That's where the brig came from. The brig was a conscious decision to go against the grain of what you'd expect in online games, where someone gets reported, they get voted to be kicked, and then they're kicked from the game. “But what you often see in a lot of other games is that you are kicked back to the front end with a message to tell you why you've been kicked. In many ways, our assumption was that's a reward. If the sole goal of someone joining a game was to create grief for somebody else, that's the reward. The fact that they've gone back to the front end says, they've kicked you, and you're like, oh yeah, I ruined their game. Now I'm going to go back in and do it again. “The idea with the brig was to psychologically shift the balance of power to the people who had been griefed. So you get put in the brig, then nothing happens. That's deliberate. The people who've been griefed, they can be sick on you and they play instruments and they tell you what a bad person you are. 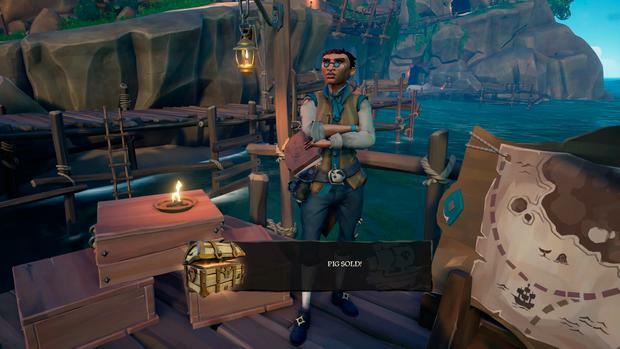 Chapman is keen to point out that once you become a pirate legend (something that might take 40 or 50 hours of gameplay), the endgame is just the beginning. Comparisons with Destiny are inevitable – as strange as it may seem initially. Rare wants you to keep playing, to seek out new voyages, except this time you’ve got the booty to show for it – a swanky galleon or swish gear, for instance.